The Classic is a lightweight single hammock that’s insanely easy to set up. 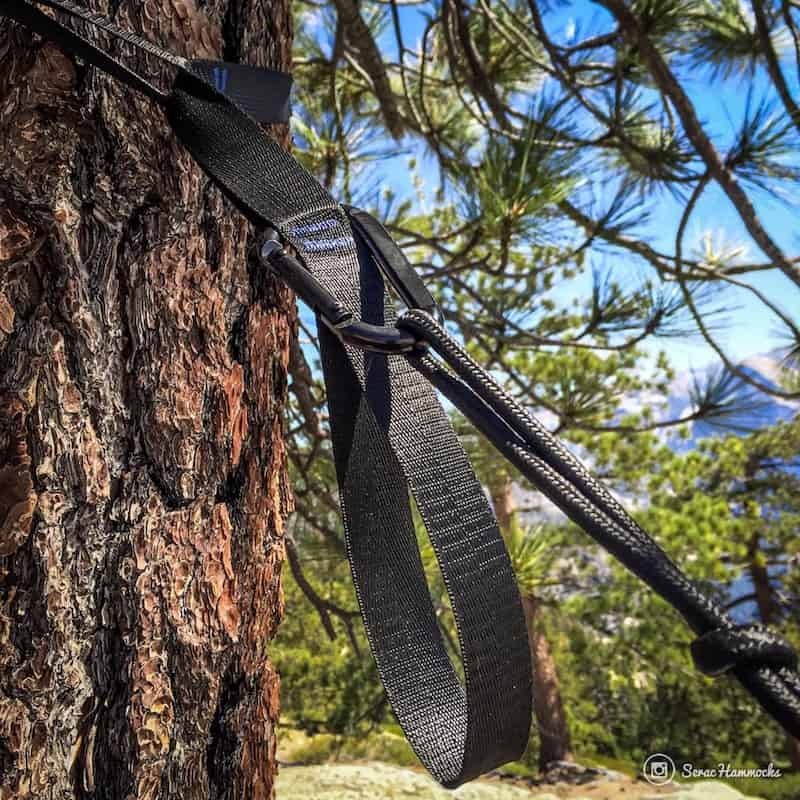 With the included tree straps, you won’t need to tie any knots! Even if you’ve never seen a hammock before, you’ll have this set up in a minute. Pop up your hammock at the campsite, or even your backyard and take a nap. Feel recharged, refreshed and ready to tackle the day ahead. What you get: Hammock, 2 6ft tree straps, stuff sack, ultra-strong carbon steel carabiners all backed by a 5yr unlimited warranty and amazing customer service. 5 As a two man startup company, it’s hard to always keep up with demand. So if we’re in stock, get yours ASAP! Lightweight and portable, our hammocks let you enjoy days on the trail without the baggage. At just 14 ounces, it goes where you go – from snow fed alpine lakes to wooded meadows. Tie it to your pack, squeeze it in a gap. You can always find room for comfort. Enjoy damaging the Great Outdoors? Neither do we. That’s why we don’t sell you ropes for “suspension”. Every hammock we sell includes a set of free tree straps. We believe in the Leave No Trace principles of protecting our environment and trees, as well as giving you the easiest possible way to relax in your hammock. When you’re looking to relax, the last thing you want to do is mess around with ropes and knots. 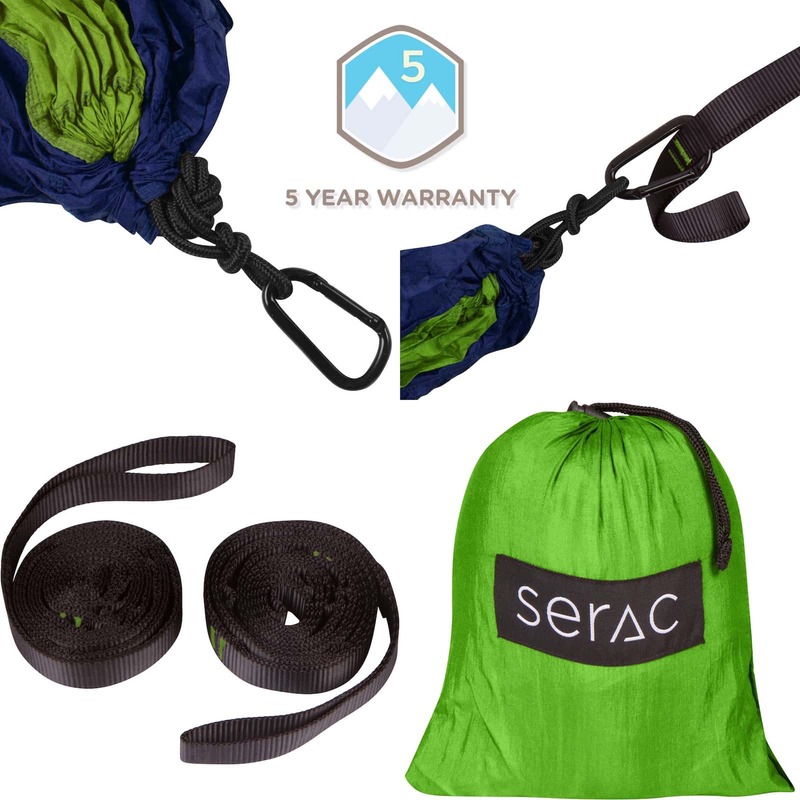 Serac tree straps make setup a breeze. With 10 loops running down the entire length of each strap, getting in your ideal position takes just seconds. Looking for a bigger, wider, double hammock? 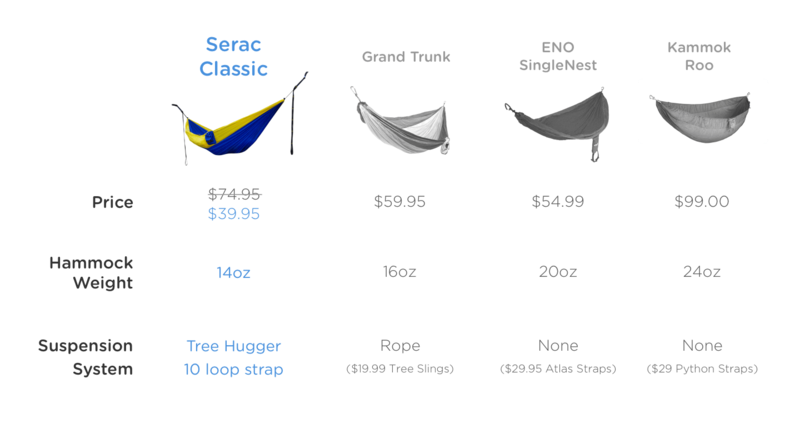 The Serac Sequoia XL might just be the perfect hammock for you! As a two man startup company, it’s hard to always keep up with demand. So if we’re in stock, get yours ASAP! AMAZING Hammock at an AMAZING PRICE!!! WOW I love my Serac hammock! The price and quality is top of the line!!! 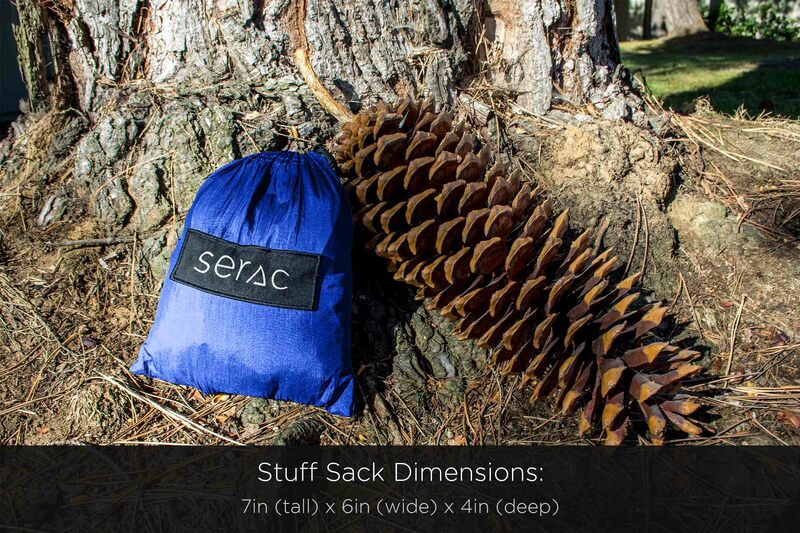 I highly recommend reading the pdf booklet from Serac on how to use the hammock correctly. In the future I’ll definitely get my wife the purple/blue one 😀 Thanks for the GREAT product! I’ve been using my Hennessy hammock for over a year now and this is right up there in quality if you’re wanting a hammock that’s more affordable! Now I find myself using my Serac more and more. Love this hammock! I’ve been using it for over a year and so far it’s held up great. It packs easily into the attached pocket pouch and is lightweight enough to throw in a daypack and not realize it’s there. It’s really nice that it comes with tree-friendly straps & biners so you don’t have to spend extra money investing in those too. The straps/biners are a little heavy if you’re counting ounces, so I just swap them out for lightweight ones when I’m backpacking. I keep one in the trunk of my car for random relaxation stops at nearby parks and waterways. Most of the places I use it have benches but this is soooo much more comfortable! I have had two of these hammocks for over a year now and they held up so well that I decided to get two more. The kids love them and you can place them almost anywhere. As I pulled the hammock straps from the pocket, I felt calluses forming on my hands. I deftly slung and looped each strap around trees in a single motion as my chest hair grew a half an inch. As I unfurled the hammock, my beard developed and seemed to grow with the hammock. With a satisfying “clack,” the carabiners were snapped onto the straps. I cried out joy, and noticed that my voice had dropped two octaves. I exuded manliness! I was a man of the wild! Grizzly Adams would be proud, jealous, and a little afraid of the man I had become. Exhilarated and awed with my accomplishment, I prepared to removed the high-ankle, steel-toed boots that had appear on my feet. I had made a home from this marvelous hammock! As I sprang into the purple and teal home of the God’s, I promptly fell to the ground and landed on my manly beard. This glorious hammock had created a safety cushion for my face. My wife laughed and told me to read the instructions. Designed, tested, and inspired by the Sierra Nevada. Our background comes from designing at the most cutting edge tech firms of Salesforce and Google in San Francisco. Rest assured, our hammocks won’t let you down.